Repetition: The action of repeating or saying over again; reiteration. Rhetorical Repetition: The use of repeated words or phrases for oratorical effect. (Gk. rhetor: "speaker in the assembly"). Why would one choose to repeat oneself? Repetition builds redundance into a text. However, as a rhetorical device, repetition can be used for emphasis or reinforcement of a key idea. In Home at Grasmere repetition has three effects which all bear upon the nature of the text and of the poet's desire to persuade and convince himself that the chosen place is the right place. These effects are: reinforcement; redundance; overstatement. When used positively, it works to build up and emphasise the description or the relationship described. When it works negatively it has the effect of undermining what has been declared. Either way, repetition is a powerful tool. What is a Rhetorical Effect? A rhetorical figure concerns the deliberate arrangement of words to achieve a particular poetic effect. Rhetoric does not play with the meaning of words, rather it is concerned with their order and arrangement in order to persuade and influence or to express ideas more powerfully. In origin, rhetoric was oral, concerned with the development of eloquent speech in order to communicate a particular position or argument. It was highly prized in Ancient Greek and Roman society, with schools teaching the skills necessary to excel in the five stages (invention, arrangement, style, memory, delivery). Over time rhetoric became codified in rules and handbooks. Key texts are: Aristotle's Rhetoric; Quintilian's Institutio Oratoria; Cicero's De Oratore. Rhetoric has a powerful literary effect as well as bearing within it implicit emotional or psychological suggestions in relation to the speaker or the subject. In Classical Rhetoric in English Poetry, (London: Macmillan, 1970) Brian Vickers beautifully describes the figures of rhetoric as "little reservoirs of energy, each having its own general scope which is then given a particular form and pressure by its context in a literary work" (122). There are numerous rhetorical terms for all kinds of shaping and patterning of language. For modern purposes it is not necessary to know these, but wherever possible they have been given below. Developments in literary criticism in the late 20th century led to the re-invention of rhetoric in the hands of deconstructionists. Deconstruction is a form of enquiry which aims to take the literary work apart in order to re-build it, examining conflicts within it and showing that there is no single stable meaning for a text. Deconstruction is thus also concerned with exploring different modes of signification and with the deconstruction of figurative and rhetorical strategies in a text. Key critics in relation to Wordsworth include Geoffrey Hartman and Paul de Man. In the interests of accessibility, however, the use of rhetoric on this site will take more traditional approach. 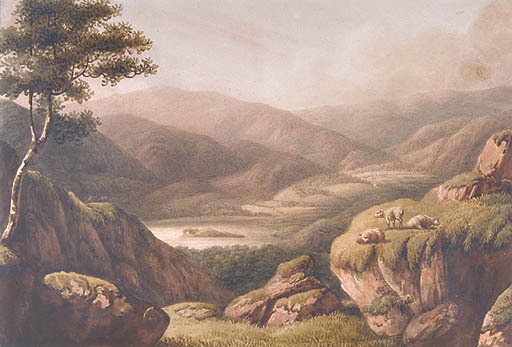 Since Wordsworth is a Romantic writer, ostensibly representing a new form of poetry which is opposed to the neo-classical principles of the eighteenth century, it is perhaps surprising to find such a high level of rhetorical repetition in Home at Grasmere. Why is this the case? We can offer a number of possibilities. 1. Although Wordsworth is a central figure of British Romanticism he is also self-consciously aware of his place within a poetic tradition. Since Home at Grasmere is his first attempt at epic (as the first book of "The Recluse") it is perhaps not surprising that he should turn to more classical devices. Milton's influence, and the complex rhetorical structures of Paradise Lost are also strongly felt (explicitly in the Prospectus). 2. Wordsworth tends to privilege speech over writing and to think of poetry as speech wherever possible. In the light of this it is perhaps less surprising that as he began to develop a model for a fairly loose, conversational, blank verse style, he drew upon techniques associated with oral performance (albeit stylised ones). 3. The primary purpose of rhetoric is to persuade the listener of one's position. In the light of Home at Grasmere's subject matter this is highly significant. Although the poem superficially appears to be a joyous celebration of the poet's finding of home, it is often conflicted. The poet-narrator seems to experience doubts and uncertainties about his decision to move to Grasmere and about his role within the community. In the light of this it is extremely interesting that the poem should be so full of rhetorical strategies. We might ask, who is it that the poet is trying to convince? The reader or himself? The effects of repetition as a redundant or near-tautological use of language in the poem have been discussed by various critics. Two positions are summarised below. In other words, Wordsworth repeatedly uses circular imagery or repetitive methods not to avoid himself but to find himself in a new way: "redundancy works . . . to assert a plenitude of meaning that cannot be described, let alone transcended" (18). Ultimately for Johnston, the localised rhetorical effects work to reinforce the larger circularity and self-containment of the poem and to create a "self-validating" (21) structure. This creates problems for the poem as the first book of The Recluse, however, since it makes it difficult for the poem to be enlarged or taken forward. Bruce Clarke, in "Wordsworth's Departed Swans: Sublimation and Sublimity in Home at Grasmere," (1980), focuses upon rhetoric as a form of displacement in the poem, allowing the poet to evade conclusions he does not wish to reach. This leads him to define a localised form of "reciprocal redundance" as in the example "then where, where then" (MS B, Reading Text, lines 83-85). Of such uses of repetition he states: "This is reciprocal redundance in miniature: a pairing together and playing off of parallel but distinct attributes of the same grammatical and perceptual whole" (361). Clarke's "reciprocal redundance" corresponds to the traditional Greek rhetorical form of "Antimetabole" (see table below). However, in Wordsworth's hands this device does not serve to convince another so much as to undermine the poet-narrator himself. Clarke thus uses localised rhetorical repetition as part of a larger argument which presents the poem as centred upon a counter-sublime response to nature, "sublimation" rather than the sublime. Thus, "reciprocal redundance reflects the play of sublimation throughout the enclosure of Grasmere" (361).